supposed to write, Native American, or Native Californian, but I resist change. 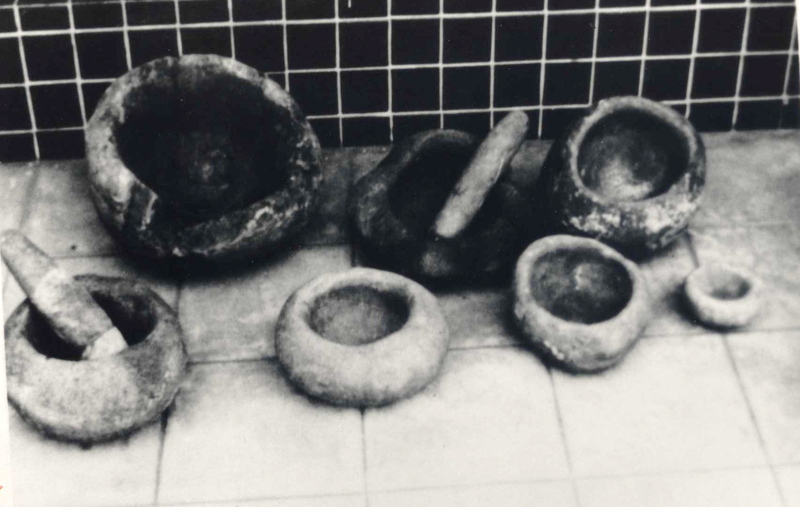 The most visible artifacts were mortars and pestles. It seemed every ranch must have a mortar and pestle in the flower garden nearest the front door. Perhaps several mortars, and no pestles; for the pestles go missing, being smaller, and more often than not it is just the mortars. Rounded boulders perhaps a foot or so in diameter, with a smooth deep hollow where the acorns and other seeds were ground. The California Indians were balanophages, acorn-eaters, just as our ancestors in the Europe of ten thousand years past were balanophages. Such a mortar may represent the work of a millennium or more. The grinding of acorns for generation upon generation of people. In subsequent years I visited old ranches in the Central Valley and Sierra Nevada foothills, and always, almost always, there were the mortars. One could guess that they were an item of pride amongst the old ranchers. By the 1890s, with the Indian population worse than decimated, there arose a golden glow of nostalgia, and boxes of peaches bore beautiful labels showing a beguiling dark-skinned lass with flowers in her hair: “Kaweah Maiden,” and ranchers discovered they must have a mortar near their front door. hence we know it as the “Wilhelm-Baynes” translation. She had had an affair with F. Scott Fitzgerald, or D.H. Lawrence, or some such nob, in Taos, New Mexico, while married to de Angulo, and they divorced, and she, I believe, married a man named Baynes. was of the Spanish nobility, but had a lust for adventure which led him to California instead of to college, and he made a kind of living with horses in northeastern California, where he befriended the Pit River Indians. Then, having anticipated Henry Miller by a number of decades, around 1905 or so Jaime bought a ranch in Big Sur. He determined to drive a herd of horses down the length of the state, from the Pit River to Big Sur, and hired on an Indian to help. They duly drove the horses south and arrived at the ranch in Big Sur. Now, it had not escaped the notice of Jaime de Angulo that all the real ranchers in California had mortars in their gardens. He managed to locate a nice mortar, and placed it artfully to one side of his fireplace, on the hearth. He was proud of his mortar, as any California rancher was proud of his or her mortar or mortars. But his Indian drover was terrified, and insisted Jaime carry it outside the house, for it was, he said, an object of great magic, very powerful, and possibly angry at having been moved to the ranch from its rightful location. For me the lure of the old ranches was akin to the lure of natural history and geology; these things had to do with bona fide reality, whereas the world most people lived in was a bizarre fiction of freeways and suburbs and fashions and politics. The “real” world was, then, in some way, accessible, via the old ranches. And could say, all the more so, via the old Indian sites. I became an expert at recognizing these archeological sites. Here in the Sierra, for instance, if there is, say, an old apple orchard which is anywhere near a spring, well, it’s about 100% certain it is an old village site. I always listened to those old-timers with intense interest. every row of trees, every field, every outbuilding, and a tall thin old man in boots, blue jeans, and a plaid shirt looked my way. I stopped to chat. I ended up meeting with Bob several times, to listen to his stories of The Way Things Were. deemed old enough to kill his first bear. Long long since had the deer and the grouse fallen, to his sharp young eyes and his steady aim. It was time for bear. He and his father had just the two saddle horses and the two pack horses with them, as they weren’t going very far, nor for very long. But they went sufficiently far, and set up camp in a meadow nestled in the deep Oregon woods, at that time untouched by the logger, and the logger’s bulldozer. They had lunch, and then his father felt like a nap. He hung his pistol upon the central tent-pole, and laid his 30.06 rifle beside his camp bed, and went right to sleep. This left Bob alone and bored. He wandered into the woods with his rifle, and saw a bear. He aimed, he fired, he killed his first bear, and all by himself, too! The bear’s body was far too heavy to drag back to camp, but he must show off his kill to his father immediately, nothing else would do, so, young Bob unsheathed his Bowie knife and cut the head off that bear. The head alone was almost too much to carry, but he staggered back into camp, hollering about killing a bear, eagerly imagining his father bursting from the tent, so amazed, so proud, probably whooping and hollering and dancing around and everything! But his father did not appear. father’s rifle, and eased himself back outside. Then it only remained to loosen a tent peg or two, and shove the bear’s head underneath the edge of the canvas, and make really loud growling and roaring sounds, while shaking the head from side to side. At which point Bob began to laugh and his father began to roar. Such was a story I gleaned from good old Pescadero. 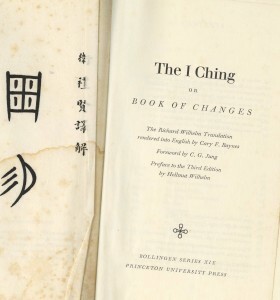 Pescaderomemories.com: Mentioning the I Ching brought back memories. I have the version you speak of. I also have the coins I used to toss for the readings. I’ve been looking for them; I know they’re around here someplace. of them, of which three are set aside at the outset, and with the rest a certain sorting process is followed, and eventually one settles upon a certain hexagram. 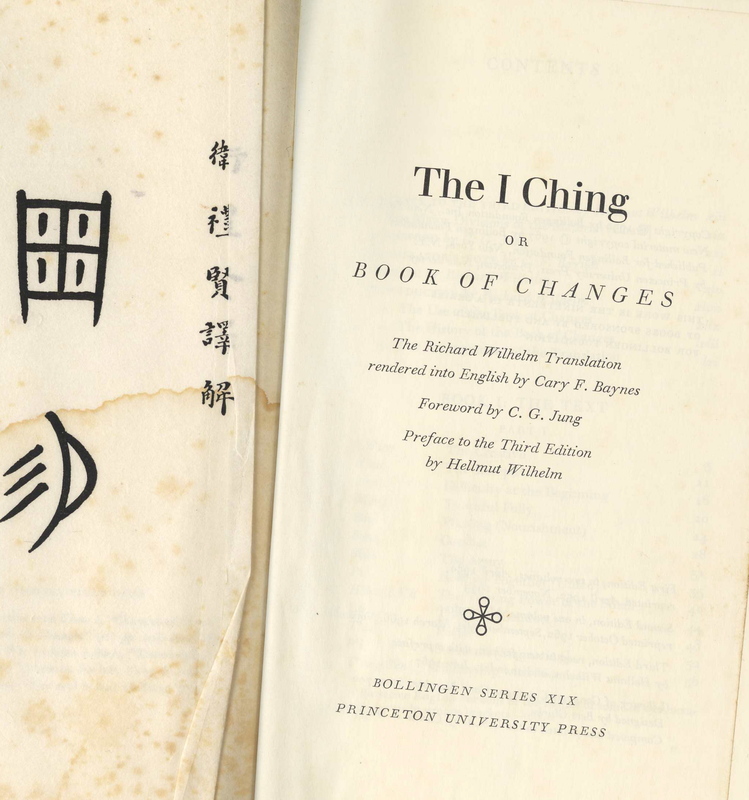 for the I Ching and were drying them in the sun beside a dirt road high in the Santa Cruz mountains, near the 2800-foot contour as I recall, where friends had rented a couple of dilapidated old cabins. We had a regular hippie commune going on there. Anyway. It so happened a San Mateo County deputy sheriff was on a Sierra Club hike, and they walked right past our remote cabins, and he saw hippies, and he saw herbs drying beside the road, and the next day there was a major bust, and, we, those of us they caught, were whisked off to jail for growing marijuana. Oddly, we really were growing marijuana, but not where it could be seen from the road. So later, in court, many people had all charges dropped, I among them. My judge actually got up form the bench and pulled out a blackboard from the wall and drew a marijuana plant and then a yarrow plant and personally questioned the deputy about his observation. Then he dismissed charges against me. Others were not so lucky. This was in, what, 1968? This entry was posted in Russell Towle and tagged Russell Towle. Bookmark the permalink.